The premium security features provided by the 355 Deadlock make it an ideal lockset for both domestic and commercial applications. Suitable for hinged and some sliding doors. Opened by key from outside and by turn knob from inside when free. 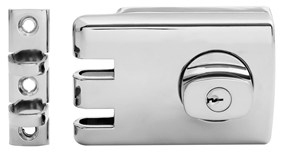 Internal key locks or unlocks turn knob.